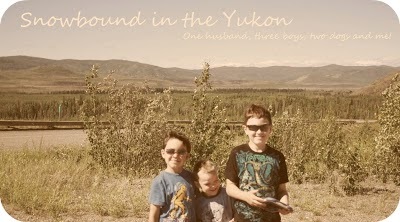 Snowbound in the Yukon: Monday Sept 14th! Okay, I told you I'd write about the Land! Land is pretty scarce up here and there are all kinds of regulations and other things to deal with, mining claims and such. Well a piece of land came up and I jumped on it and applied. There are no mining claims on it. It's going forward but an archeologist survey has to be done on it before we more forward. We haven't had a chance to go look at the land. We tried one to hike to it with the boys but Mickey didn't like the bush and wanted to go back and was whiny, so we eventually just turned back. I'm hoping to get out there soon because we haven't flagged if off yet! And we need to do that. I just got back from Vancouver and when I was flying out I got a look at the land and it looks pretty good. I just want to get out there. It's about 8 km from town so it's not too far. I'm excited and can't wait to see if it goes forward and we end up bying it and building a home! Weight loss front, no changes. Stress and daily life are keeping me back and my full concentration is not on it yet. I am planning on continuing in the gym this week and can't wait to get back to it! Oh Donna, having your own land is amazing, you lucky gal you! Good luck on that!